DJ Shadow, left, and Cut Chemist take the reins of Afrika Bambaataa’s collection on a tour that stops in Buffalo. Paying homage to former musical greats is a dying art, many music fans would argue. Countless modern hip-hop and electronic dance music artists are obsessed over what's new -- or throwing themselves upon the next trend -- not thanking the building blocks for the platform on which they now stand. 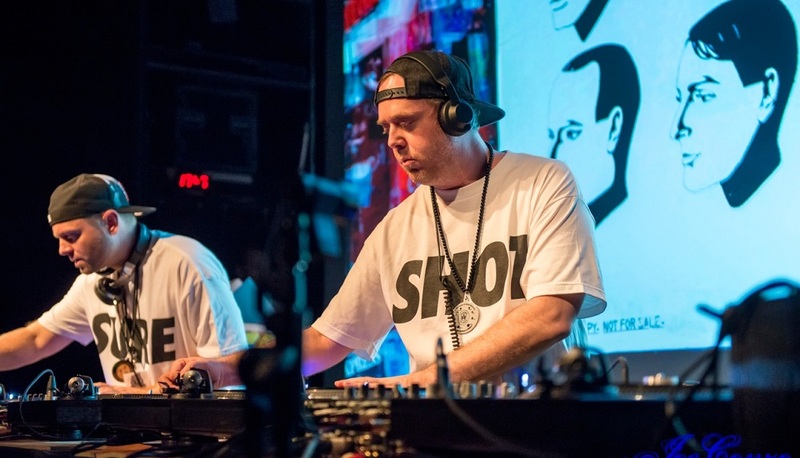 EDM stalwart DJ Shadow and Jurassic 5 member Cut Chemist continue to buck that trend on their current Renegades of Rhythm tour, which hits Buffalo at 8 tonight in Town Ballroom (681 S. Main St.). Tickets range from $27.50 to $30. After visiting Cornell University, where Universal Zulu Nation founder and hip-hop patriarch Afrika Bambaataa houses his collection of over 40,000 vinyl records, DJ Shadow and Cut Chemist embarked on a tour aimed to weave together many of these beats -- some familiar, some obscure. According to the Boston Globe's report, the pair of DJs received permission from Bambaataa to delve into the overflowing cases of vinyl, a treasure chest of sorts. Hip-hop, soul, funk and even some jazz samples from the '70s and '80s -- the period in which the 42-year-old Shadow started to listen to the artists who would later fill in his 60,000+ disc collection -- will resonate throughout the Ballroom, while album covers from Rick James, Public Enemy and others loop as background visuals. DJ Shadow's personal album collection is steeped with old-school hip-hop. According to Syracuse.com, which reviewed the EDM duo's show last night, old school hip-hop tracks from Run-DMC, Beastie Boyz, Whiz Kid and Grandmaster Flash, among others, were blended effortlessly by the two turntable wizards. "Shadow noted that it was his first all-vinyl show in six years, and loved going back to the simplicity of six turntables with his longtime friend and collaborator," Syracuse.com writer Geoff Herbert wrote. "They also had fun jamming on drum machines older than this year's college freshmen, but more importantly paying tribute to a man who laid the groundwork for today's stars like Jay Z and Kanye West." In other words, Tuesday night in Buffalo will be the musical intersection where old meets new, where those in the limelight cherish the works of those largely forgotten.